It’s the space-opera analog of the Mayflower landing in modern Boston, filled with high technology, different customs, and 747’s cutting their travel time down to hours. Battling conspiracy, politics, and even pirates, Maggie must rise to the challenge or face her colony’s doom. Available for Kindle and in Print . Read the free sample. Hey Dan – Nathan at nathanlowell.com suggested your book – I really enjoyed it – please keep up the stellar work. I too read Nathan’s recommendation and picked up your book. Great stuff. Looking forward to more Father Chessman tales. Picked up book based on recommendation on NathanLowell.com. Was pleased. 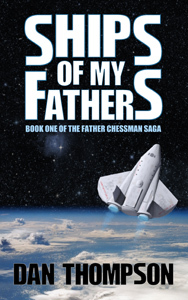 What are your plans for more Father Chessman books in the saga? I’m glad you enjoyed Ships of My Fathers. The sequel, Debts of My Fathers, is in edits right now. I’m targeting the end of the year for release. The overall series should have five books and will likely wrap up sometime in 2015. 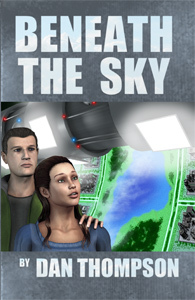 In the meantime, another book of mine, Beneath the Sky, is in the same universe as Ships of My Fathers. Still targeting end of the year for the first sequel, or has this needed to slip? Alas yes, the sequel has slipped. I’m want to get closer before I announce a new date, but it will be sometime in the spring, hopefully not as late as May. I am about to hand it off to my beta readers, and then it’s a few fixes after that, polishing, and then the copy editor and formatting… it adds up. Do you have a revised date when your next book will be out? It currently looks like December 2014. Be sure to subscribe to the mailing list at the site’s new home (DanThompsonWrites.com) to get notification when that happens.